One of the biggest milestones kids experience during the school-age years is learning how to read. Once they unlock those magical words on the page, the whole wide world opens up for them. 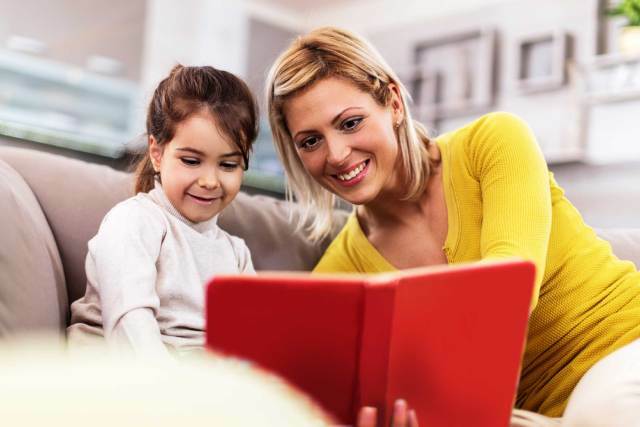 Whether it’s a lovely story for beginning readers like Frog and Toad or a can’t-put-it-down chapter book series like Harry Potter, both younger and older school-age children have plenty of options when choosing a great children’s book. But while it’s important for kids to learn to read on their own and to continue to read books by themselves to strengthen their reading skills, it’s also a good idea for parents to keep reading with them, even when kids become strong readers. Here are some reasons why parents and kids should keep reading together. Encourages a Love of Books : When reading is a regular part of your family routine, it becomes a normal thing like eating dinner together or bath time. And the more your child reads with you and sees you reading your own books, the more he’s likely to love diving into a good story, too. When you cultivate a love of books with young children by reading with them, you’re instilling a great habit that’ll last your child a lifetime. More Book Time Means Less Time on Screens : When you make reading a built-in part of your schedule, it’ll naturally translate into reducing your child’s screen time. You can also make sure that the time your child does spend using tech devices includes educational content like online math games, which means she’ll have to figure out how to manage her time on a screen (a very useful skill that’ll come in handy as she grows older and has to spend more time on tech devices for academic and social reasons) while reading every day. Spend Time Together and Strengthen Your Relationship : One of the best ways to connect with your child is by opening up a good story. Not only will it be a wonderful way to spend time together and strengthen your bond with your child, but it will also give you a chance to share your reactions and thoughts and opinions about whatever story you’re reading. It will encourage your child to think and to form his own opinions and communicate them. Doing things together with your child is a great way to stay connected, and just as doing active things like bike riding or going for hikes will help him stay physically fit, reading together will help your child become intellectually strong. Help Kids Practice Reading out Loud an Important Skill : As your child’s reading skills grow, you can take turns reading passages from the book out loud. Doing this will boost your child’s self-confidence and help them becomes used to reading to others, which will be a useful skill in school. Reading aloud also helps kids improve pronunciation, increase their vocabulary, and help them really access and understand the deeper meanings of a story. It’s a Fun : Just because you’re a grownup, it doesn’t mean you can’t enjoy a great kids’ book like the Harry Potter series or The Mysterious Benedict Society series. One of the biggest perks of reading great kids’ books with your child is that it’s fun. And having fun with your child has benefits that extend beyond bringing you and your child closer together in the present: Research has shown that parents playing and having fun with kids is one of the best ways to increase a child’s chances of being happy and healthy later in life.